The Lisboa Hotel and Casino, known throughout Asia as 'the landmark of Macau,' was built in 1970 by Macau's grandfather of gaming Dr. Stanley Ho. Dr. Ho created SDTM - Sociedad De Turismo Macau - with three partners, Teddy Yip - ladies man, auto racing icon and creator of the Macau Grand Prix, Yip Hon, a certifiable gambling god whose massive win at Caesars Palace resulted in the construction of the Brahma Shrine, and Henry Fok, international business man who was suspected of smuggling weapons into China during the UN-sanctioned embargo in the 1950's. Having operators of dubious origins is only one of the many parallels between Macau and Las Vegas. 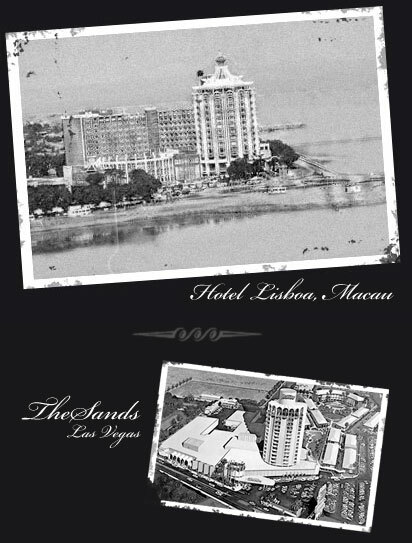 Macau's most famous hotel - it's Flamingo, by Vegas comparison - the Hotel Lisboa, was built in 1970 where Avenida de Amizade meets Nam Van Lake, and the land south of it was still yet to be reclaimed (see photo). It's architecture, a round 12 story copy of the Sands Las Vegas' hotel tower was expanded in 1991 with a 20 story hotel tower on the north east corner of the property. Hotel Lisboa is a traditional 'grand hotel' in Portuguese style. The Hotel Lisboa's lobby features, what was in 197x, a spectacular chandelier, polished black marble flooring with gold and silver inlaid mosaics and a fantastic curved staircase. It's surrounding areas contain many artifacts of Chinese history including ancient furniture, vases, elaborate jade statues and ancient wood carvings. There is also an extremely peculiar display of preserved peacocks and other beaked birds throughout the hotel's public areas. Set further back from the main lobby is a shopping/dining area that, with few exceptions, has been pickled in formaldehyde since 1974. Every ten yards a new level of garish decor dazzles the mind and stretches the possibilities of what could be considered tasteful. Restaurant entrances enshrined by tacky beveled mirrors give way to gaudy dime store costume jewelery styled gemstone arcs that signify the entrances to Hotel Lisboa's public casinos. Amalgamated polished marble - a stone masons analogue to particle board - lines hallways dotted by vintage restaurant signs encased in forty years of shellac and faux-glitzy LED light boards that are more Lite-Brite than Diamond Vision. Public areas are awash in a detached, transient fog that echoes any vintage municipal building - City Court, the DMV, a Federal building or any other construction whose primary reason for existing is to propagate bureaucracy. Hotel Lisboa is cold and hard - there's not a comfy couch, cushy chair or cozy bar in sight.